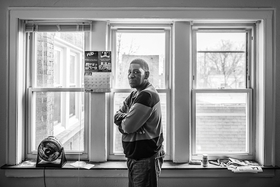 Ricardo Gist received housing through Chicago's Center for Housing and Health program. Since the advent of healthcare reform in 2010, Illinois Medicaid enrollment has grown to over 3 million people. The bill for that care came to $14 billion in 2014 alone. But almost half of that was spent on care for just 100,000 people—many of them emergency room “frequent fliers” who are poor and suffer from high rates of diabetes, kidney disease, congestive heart failure, mental illness and substance abuse. Of those 100,000, an estimated 4 to 5 percent are homeless. This year, University of Illinois Hospital & Health Sciences System and partners are testing a program to reduce these costs. It is modeled on a strategy known as “Housing First” that is catching on across the country. The idea is: Take people who are chronically abusing drugs and alcohol, resisting help, unable to keep a job and committing petty crimes. Give them an apartment, no strings attached. Even buy them furniture and appliances. And watch their use of emergency rooms drop. Critics of these efforts say they don't deal with the fundamental problem of finding jobs for homeless people who may lack even basic skills. Some also say that they amount to giveaways that absolve people of their personal responsibilities. But advocates such as Arturo Bendixen, executive director of Chicago's Center for Housing and Health, which is partnering with the hospital on the pilot project, say providing free shelter, even when clients are under no obligation to stay sober or find a job, will improve their health so much that they will be less of a burden on the health care system and society. When they're not in Brown's West Side ER, they might be down the street at Rush University Medical Center or Cook County's John H. Stroger Jr. Hospital. Factor in the other places super-utilizers might access—psychiatric hospitals, food pantries, shelters, jail—and though the chronically homeless make up less than 20 percent of the general homeless population, the public costs add up to between 80 and 90 percent of the total cost of services to all. The one-year pilot program is supported by $250,000 from University of Illinois Hospital. The funding could house about 20 people for a year at a monthly cost of $1,000 per person. Combing through records of chronically homeless people who are high users of hospital services, Brown and a panel of doctors, psychiatrists and social workers identified 120 people who might be helped by this program. In five months, they've found housing for 14, with two others scheduled to move in by May. It's a drop in the bucket, of course. Chicago estimates 6,300 adults are homeless in the city at any given time. Still, supporters think the effort shows what might be done. Brown says one person in the program used to visit the ER two to three times a week. The hospital hasn't seen him in more than three months now, he says. Brown, 59, is a former Motorola systems engineer turned social worker. When he moved into health care in 2005, he was stunned that the industry was not paying attention to the social factors affecting health, including housing. Changes under Obamacare are forcing hospitals to look more holistically at emergency medicine. Before the Affordable Care Act, the health care industry operated on a fee-for-service model: The hospital provides a service; the insurance company pays the bill. Since the law kicked in, however, “outcome-based” health care is becoming the preferred model. Now hospitals are getting paid a premium if they reduce expenses by keeping patients out of the hospital. Still, it's unlikely this program will be widely adopted in the near term. Under federal law, housing is not reimbursable by Medicaid. But there are workarounds. Since 2013, New York State Medicaid has allocated $383 million of state money to fund capital investment, rental subsidies and services for its high-need users—and the initiative has funded 9,013 new units of permanent supportive housing statewide. Managed care organizations such as IlliniCare and Blue Cross & Blue Shield also could pay someone's rent on their own. As a policy directive, Housing First has been embraced by more than 17 U.S. cities since it was endorsed by the Department of Housing and Urban Development in 2002. Salt Lake City reduced chronic homelessness by 72 percent after adopting a Housing First strategy. Los Angeles has proposed spending $1.85 billion over 10 years to build long-term affordable housing and expand supportive services and outreach for the city's estimated 26,000 homeless. New York has pledged to add 15,000 units of supportive housing over the next 15 years. The university's pilot could continue until January, when Brown expects the money will run out. After that, he hopes he'll find philanthropic support to keep going for one or two more years and state funding after that. This story, "This program could lower healthcare costs in Chicago" was produced as part of a fellowship with the Social Justice News Nexus at the Medill School of Journalism, Media, Integrated Marketing Communications at Northwestern University and originally appeared in Crain's Chicago Business.